Pinging is done to check for a connection between two nodes in a network or between the networks. This would assess the time taken to reach between the two nodes and time for the response. These nodes can be either in a single network in local area, or in a wide area network or anywhere on the Internet, and depending on that the Ping time would change. 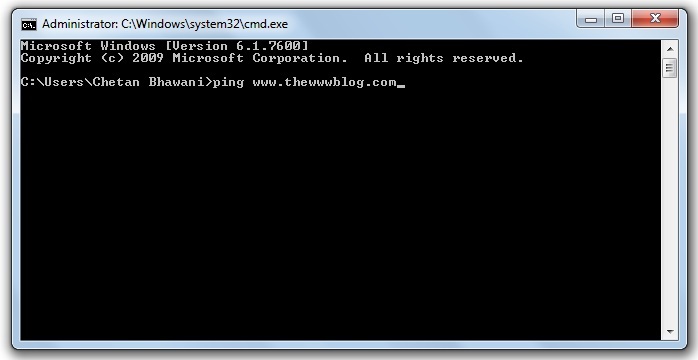 To ping an IP Address, you need to go to Start > Run if it is a Windows 7 or earlier version of OS, but in the new Windows 8 operating system, you need to hit the Windows key and directly type “Run” to show the search results, where the Run command appears. In the Run window, type cmd and press enter. You may also search for cmd.exe in the search if Run doesn’t appear in the results list. 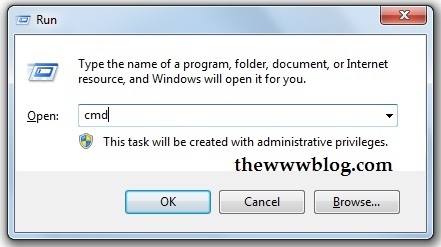 Once you open the Windows Command, type ping and the website address, i.e. www.thewwwblog.com (the following should be typed: ping www.thewwwblog.com) if we are trying to ping the main web server of the website. Hit enter after entering the text. 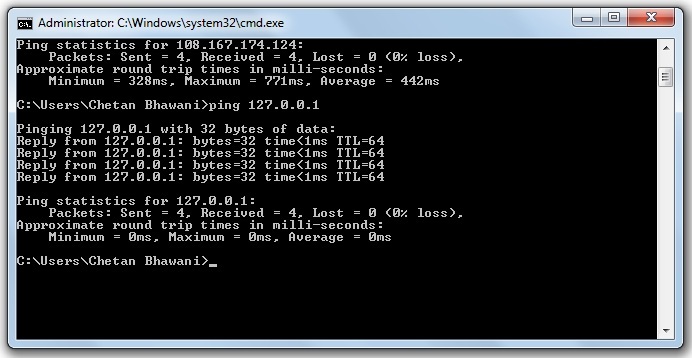 Once the ping is done, you can check the statistics given there, with the bytes and the time taken for a single ping. It would show the statistics for the IP address of the website. To check the node response and ping the local network, you should enter the local IP address, i.e. 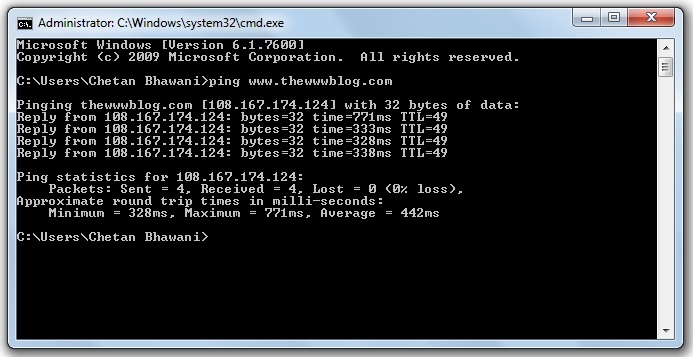 127.0.0.1 by typing ping 127.0.0.1 and you should see the response as statistics / ping output. 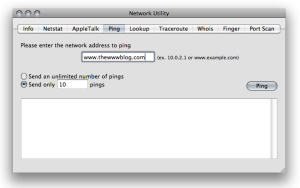 To ping on Mac OS computer, you need to go to the Utilities section under Applications folder, and there you need to open Network Utility. 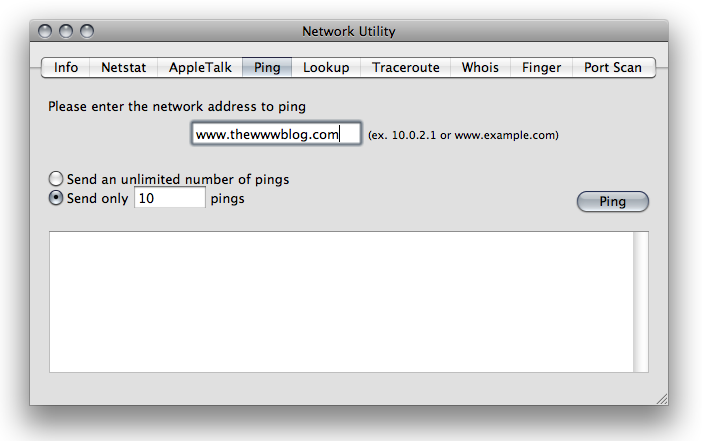 In the Network Utility, you need to enter the web address in the section and type the number of pings you want to receive. One can also choose to send an unlimited number of pings too, and you would see the similar ping response as in the Windows command section. Once the pinging process is going on, you may choose to stop it. The process to ping on a linux PC too is similar to the above ones, except that you need to open the Terminal window here, also called as telnet. Open telnet/TERMINAL window. The next step would be similar to the above ones, where you type ping www.thewwwblog.com (replace thewwwblog with the address name you want to check), or the IP address to ping the website server or the IP address. If you type the host’s IP address and still the problem persists, then it could be because the host server is down or unreachable. If the above error is shown, then the home network connection is not set up correctly. The network configuration or the NIC (Network Interface Card) might be corrupted. Check out the tutorial How to refresh IP address if you wanted to do so on the Windows OS computer, from the same command prompt tool.